Bikini Atoll ( or ; Marshallese: 'Pikinni', [pʲi͡ɯɡɯ͡inʲːii̯], meaning "coconut place") is an atoll in the Marshall Islands that was the site of 23 nuclear tests during the 1940s and 1950s. The atoll consists of 23 islands totalling 3.4 square miles (8.8 km2) surrounding a 229.4-square-mile (594.1 km2) central lagoon. It is at the northern end of the Ralik Chain, approximately 87 kilometres (54 mi) northwest of Ailinginae Atoll and 850 kilometres (530 mi) northwest of Majuro. Within Bikini Atoll, Bikini, Eneu, Namu and Enidrik islands comprise just over 70% of the land area. Bikini and Eneu are the only islands of the atoll that hosted a permanent population. Bikini Island is the northeastern most and largest islet. The atoll was also known as Eschscholtz Atoll, after German naturalist Johann Friedrich von Eschscholtz, until 1946, after the Marshall Islands were captured by the U.S. during World War II. This article is about communications systems in the Marshall Islands. In 2010, the Majuro and Kwajalein Atoll were connected to the Internet using the HANTRU-1 undersea cable to provide high-speed bandwidth. Faster Internet service was rolled out to Majuro and Ebeye on April 1, 2010. Enewetak Atoll (; also spelled Eniwetok Atoll or sometimes Eniewetok; Marshallese: Ānewetak, [æ̯ænʲee̯ɔ̯ɔ͡ɛɛ̯dˠɑk], or Āne-wātak, [æ̯ænʲee̯-ɒ̯ɒ͡ææ̯dˠɑk]) is a large coral atoll of 40 islands in the Pacific Ocean and with its 664 people (as of 2011) forms a legislative district of the Ralik Chain of the Marshall Islands. With a land area total less than 5.85 square kilometres (2.26 sq mi), it is no higher than 5 meters and surrounds a deep central lagoon, 80 kilometres (50 mi) in circumference. It is the second-westernmost atoll of the Ralik Chain and is 305 kilometres (190 mi) west from Bikini Atoll. It was held by the Japanese from 1914 until its capture by the United States in February of 1944, during World War II. Nuclear testing by the US totaling more than 30 megatons of TNT took place during the cold war; in 1977–1980, a concrete dome (the Runit Dome) was built on Runit Island to deposit radioactive soil and debris.The Runit Dome is deteriorating and could be breached by a typhoon, though the sediments in the lagoon are even more radioactive than those which are contained. Kwajalein Atoll (; Marshallese: Kuwajleen [kʷuɒ͡æzʲ(æ)lʲɛːnʲ]) is part of the Republic of the Marshall Islands (RMI). The southernmost and largest island in the atoll is named Kwajalein Island, which its majority English-speaking residents (about 1,000 mostly U.S. civilian personnel) often called by the shortened name, Kwaj . The total land area of the atoll amounts to just over 6 square miles (16 km2). It lies in the Ralik Chain, 2,100 nautical miles (3900 km) southwest of Honolulu, Hawaii. The Legislature of the Marshall Islands (Marshallese: Nitijeļā) has 33 members, elected for a four-year term in single-seat and five multi-seat constituencies. The last election was November 21, 2011. Elections in the Marshall Islands are officially nonpartisan, but most members of the Nitijeļā are affiliated with one of the four active political parties in the Marshall Islands: Aelon Kein Ad (AKA), Kien Eo Am (KEA), United People's Party (UPP), and United Democratic Party (UDP). This is a list of airlines currently operating in Marshall Islands. Majuro (; Marshallese: Mājro [mʲæzʲ(ɛ͡ʌ)rˠɤ͡oo̯]) is the capital and largest city of the Marshall Islands. It is also a large coral atoll of 64 islands in the Pacific Ocean. It forms a legislative district of the Ratak (Sunrise) Chain of the Marshall Islands. The atoll has a land area of 9.7 square kilometres (3.7 sq mi) and encloses a lagoon of 295 square kilometres (114 sq mi). As with other atolls in the Marshall Islands, Majuro consists of narrow land masses. The main population center, Delap-Uliga-Djarrit (DUD), is made up of three contiguous motus and has a population of 20,301 people as of 2012. Majuro has a port, shopping district, hotels, and an international airport. The Marshall Islands has competed in three Summer Olympic Games as of the completion of the 2016 Summer Olympics in Rio de Janeiro, Brazil. The nation has never competed in the Winter Olympic Games. The Marshall Islands had its Olympic debut at the 2008 Summer Olympics in Beijing, China. The highest number of Marshallese athletes participating in a Summer Games is five in the 2008 games in Beijing. No athlete from the Marshall Islands has ever won a medal at the Olympics. Marshall Islands – United States relations are bilateral relations between Marshall Islands and the United States. The music of the Marshall Islands has a long history. The Marshall Islands are an independent island chain, geographically and culturally part of the Micronesian area. 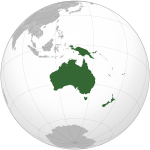 It was part of the Trust Territory of the Pacific Islands, governed by the United States, until independence in 1986. The roro is a kind of traditional chant, usually about ancient legends and performed to give guidance during navigation and strength for mothers in labour. Modern bands have blended the unique songs of each island in the country with modern music. Though drums are not generally common in Micronesian music, one-sided hourglass-shaped drums are a major part of Marshallese music . The national anthem of the Marshall Islands is "Forever Marshall Islands", by Amata Kabua. The President of the Marshall Islands is the head of government and head of state of the Marshall Islands. The president is elected by the Nitijeļā (Legislature) from among its members. Presidents pick cabinet members from the Nitijeļā. Amata Kabua was elected as the first president of the republic in 1979. Subsequently, he was re-elected to four-year terms in 1983, 1987, 1991, and 1996. After Amata Kabua's death in office, his first cousin, Imata Kabua, won a special election in 1997. Casten Nemra, who was elected and took office in January 2016, was replaced by Hilda Heine one week later. Religion in the Marshall Islands is as of 2009 dominated by major Christian faiths introduced by Western missionaries since around 1857. In 2017, major religious groups in the Republic of the Marshall Islands are United Church of Christ (formerly Congregational) (51.5%), Assemblies of God (24.2%), Roman Catholic church (8.4%), The Church of Jesus Christ of Latter-day Saints (Mormons) (9.5%), Bukot Nan Jesus (also known as Assembly of God Part Two) (2.2%), Baptist (1.0%), Seventh-day Adventists (0.9%), Full Gospel (0.7%), Baha'i Faith (0.6%). Persons without any religious affiliation account for a small percentage of the population. The Jehovah's Witnesses are believed to have a few hundred practitioners. There are fewer than 20 people of Jewish faith and fewer than 20 members of the Ahmadiyya Muslim Community. Foreign missionaries are present and operate freely. Religious schools are operated by the Roman Catholic Church, United Church of Christ, Assemblies of God, Seventh-day Adventist Church, Bukot Non Jesus, and the Baptist Church. The Constitution provides for freedom of religion, and the Government generally respects this right in practice. In 2007, the US government received no reports of societal abuses or discrimination based on religious belief or practice. Visitors to the Marshall Islands must obtain a visa in advance unless they come from one of the visa exempt countries or countries whose citizens are eligible for a visa on arrival. Women in the Marshall Islands are women who live in or are from the Republic of the Marshall Islands, an island country that is politically a presidential republic in free association with the United States. Alternative appellations for these women are Marshallese women, Marshall Islander women, Marshalls women, and women in Rālik-Ratak (literally women "facing toward the windward" [i.e. facing sunrise] and "facing toward the leeward" [i.e. facing sunset]).